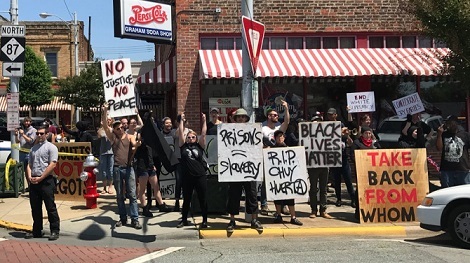 Minor scuffles between protesters affiliated with the Triangle International World Workers (IWW), Antifa and the Alamance County Taking Back Alamance County (ACTBAC) broke out during an event held on Saturday, May 20th in Graham, North Carolina. According to the Alamance County Sheriff, IWW protestors came armed with knives. A few ACTBAC members came bearing muskets and some wore Confederate uniforms. All parties were instructed to take their implements back to their vehicles and all allegedly complied. Some protesters, likely Antifa, wore all black with their faces partially covered and were seen intermixed with the IWW demonstrators. At least five arrests ensued during and after the event, which was an observance of Confederate Memorial Day. ACTBAC had a permit for the event, which was to begin at noon that day. Some of those arrested included a Duke University math lecturer – Rann Bar-On. Bar-on was charged with felony assault on a law enforcement officer and misdemeanor injury to personal property. Bar-On’s charge of injury to personal property stemmed from a failed attempt to destroy a flag of some type. According to Sheriff Terry Johnson, Bar-On had taken down the flag before the rally had even begun, torn it from the pole and was trying to pour some sort of liquid on it. When Johnson intervened, Bar-On hit the officer with the flagpole. Bar-on’s bond was set at $11,500. William Anthony Hood of Chapel Hill was charged with assault on a law enforcement officer, inflicting serious injury and misdemeanor possession of a weapon at a parade/rally. Hood’s bond was set at $15,000. Self-described “community activist”, Gregory Southall Williams of Durham, was charged with misdemeanor resisting a law enforcement officer. Williams is a member of the Triangle IWW as is Rann Bar-On. Williams is also working on a Doctorate at Duke University. Bond for Williams was set at $1,500. Two U.S. Marines were also arrested according to the Graham Sheriff’s office. Joseph Warner Manning of Jacksonville and Michael Joseph Chesny of Havelock were each charged with first-degree trespassing – a misdemeanor. Both Chesney and Warner allegedly identified themselves as ‘film members’ of the IWW, yet their actions point in a different direction. Chesney and Warner were arrested for illegally accessing and trespassing the rooftop of a building adjacent to the event without the permission of the property’s owner. The banner also had “YWNRU” on it, which apparently stands for, “You will not replace us.” That acronym is the same that has been chanted by protesters at events related to the removal of a Confederate monument. Rann Bar-On was also arrested this past March in Durham while protesting at a city council meeting. Arrested along with Bar-On were three Divinity students, Le’Andre Blakeney, Mia Hutchins-Cabibi and Greg Williams, as well as a youth pastor named Joe Stapelton. Williams is the same individual was arrested with Bar-On at the Graham ACTBAC event. All five were charged with disorderly conduct, resisting arrest and inciting a riot. All of the charges are misdemeanor level. Bar-On was also arrested in 2005 at Fayetteville Peace Rally. After the May 20th arrests, the Triangle IWW appears to have deleted all their social media accounts. The Twitter account has been deleted as of 5/23/17. The group’s Facebook page was no longer there as of 5/28/17. This entry was posted in #SJW, Am Lens, Left Leaning, Protests, THE LEFT and tagged ACTBAC, Antifa, Gregory Williams, IWW, Rann Bar-on. Bookmark the permalink.